This is one of our favourite days in Thailand. As Thailand’s former capital city Ayutthaya is a city enriched with history and Thai culture and provided us with a well needed change of pace from the craziness of Bangkok. A must see destination for anyone wanting to get a greater understanding of Thailand’s rich history. Here we got to see the effect of Burma’s destructive nature. In the16th Century Ayutthaya collapsed when the Burmese came, knocked all the heads of the statues and kidnapped the royal family. Its all cool now. The Burmese feel pretty terrible about it now and have helped Thailand maintain the historic ruins from centuries ago. 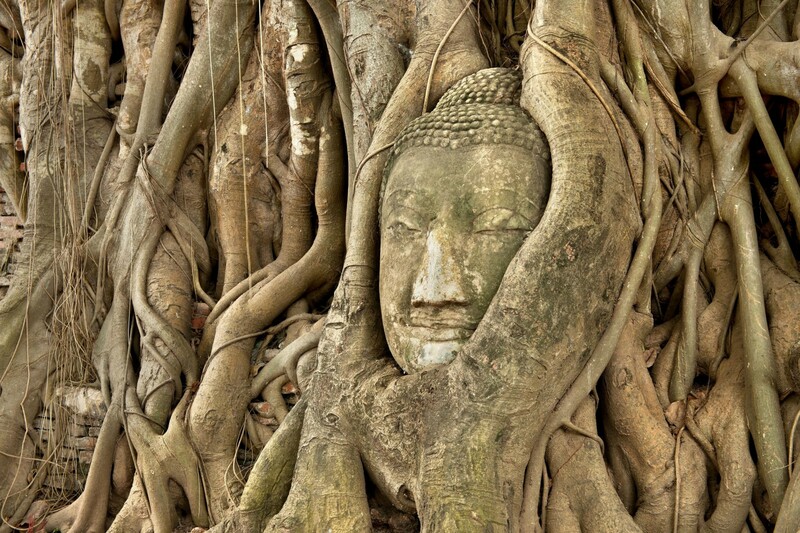 This buddha head did survive though and stood the test of time entangled in between tree roots. It makes quite the tourist attraction now. Here we got to dissemble down some extremely steep steps into the heart of central temple and into the pretty creepy Crypt. Once there and over your fears, you can still make out the amazing wall murals from the earlier Ayutthaya period. There’s something quite spectacular about being next to something created by a human hands hundreds and hundreds of years ago. This Wat across the river is much newer than the previous two, built in Ayutthayas golden age. We will be honest, its like a lot of Wats we have seen, but it was quite and peaceful and round the back they have an actual tree growing out of a Chedi. The day before we learnt that Thai’s believe that ringing the bells at temples can provides you with prosperity. After a few nervous looks around, we gave them a ringadingding. Its a bit of a trek from the other Wats but made a pleasant cycle ride once a nice Thai man shouted and pointed for us to follow a cycle and walking path that took us off the dual carriageway and away from beeping cars. The scenery was beautiful in between miles of flat countryside we cycled towards the impressive pyramidically layered white chedhi. 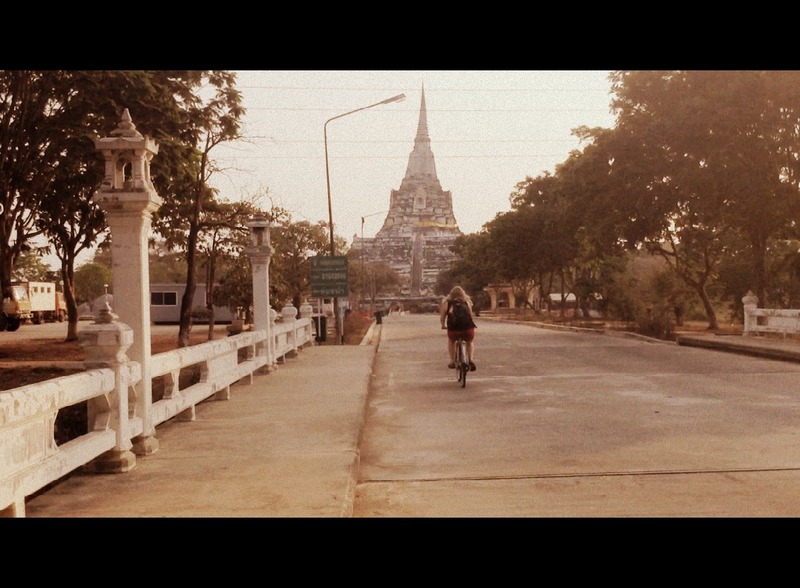 Just one day Ayutthaya and for us that felt like a good amount.We also had the benefit of finding out a lot about Ayutthaya from the Museum of Siam, which we covered in our Bangkok blog. If you have more time and aren’t sick or exploring wats then a couple of days here will keep you busy. We love cycling because its an easy way to do things at your own pace and gives you the freedom to go where you want. Traffic and general lack of road rules can be a bit scary anywhere in South East Asia so you have to be cautious. It was a pretty hot day for cycling so we coped by pouring water from the toilets onto our heads (we are not wasting our bottled water!). It did smell a bit funky but it did the trick of cooling us down. Besides we both agreed to get a bottle 7/11’s finest mineral water and shower with that before we got on the sleeper train to Chaing Mai, which turned out to be another Thai city we thoroughly enjoyed. Will write more about that next! Highlights: Seeing some really, really old stuff. Learning that it’s acceptable, and somewhat encouraged to ring those bells in temples – it gives you prosperity! Activities: Cycling and visiting an abundance of Wats and ruins from 7 centuries ago!